Our “Getting up and running with AYLIEN Text Analysis API” blogs, focus on working with the API using different programming languages. Previously we published code snippets and getting started guides for C#, node.js, Powershell, Python, Java and Ruby. Today we’re going to focus on PHP. As we did in our previous blogs, we’re going to perform some basic Text Analysis functions like analyzing the sentiment of a piece of text, detecting what language a piece of text is written in, classifying an article and generating hashtags for a URL. The idea, is to make it as easy as possible for developers to get up and running with our API and to showcase how easy it is to get started in your chosen programming language. We’re first going to look at the code in action. Then we’ll go through it, section by section, to investigate each of the endpoints used in the code snippet and the results. Note: The getting started page on our website has a range of code snippets in other programming languages and links to our SDKs. Save the file as TextAPISample.php in the docs folder of your web server. If you are using XAMPP as your web server the docs folder is typically at “xampp/htdocs”. Open a web browser and open the url “http://localhost/TextAPISample.php” to see the code snippet in action. Using the Language Detection endpoint you can analyze a piece of text or a URL and automatically determine what language it is written in. In the piece of code we have used in this blog, the “parameter” variable controls whether the call is made specifying the text directly or as a URL. In this case we have specified that, we want to analyze the following text “What language is this sentence written in?” and as you can see from the output below, it determined that the text is written in English and it gave a 0.999996 confidence score that the language was detected correctly. For all of the endpoints, the API returns the text which was analyzed for reference and we have included it in the results in each case. Analyzing the following text; “John is a very good football player!”. The API has determined that the sentiment of the piece of text is positive, we can also be pretty sure it’s correct based on the confidence score returned of 0.999999. For hashtag suggestions, we have used an article published on the BBC news website about how the moon was formed when a planet called Theia collided with the Earth approximately 4.5 billion years ago. The url for the article is as follows “http://www.bbc.com/news/science-environment-27688511”. The hashtag suggestion endpoint first extracts the text from the URL and then analyzes that text and generates hashtag suggestions for it. When we analyze the url pointing to the BBC news story, we receive the results as shown below. As you can see it has labelled the article as “natural science- geology” with a corresponding IPTC code of 13004001 and a confidence of 1. For more getting started guides and code snippets to help you get up and running with our API, visit our getting started page on our website. 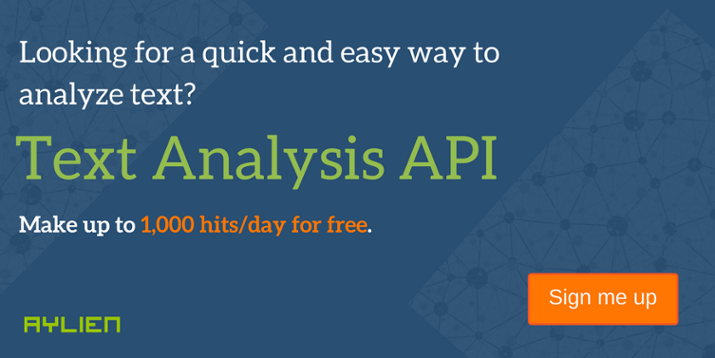 If you haven’t already done so you can get free access to our API to test it out by signing up.